Victoria because I couldn’t make myself name a shawl British Columbia, and Victoria is the capital city of British Colombia. It is situated on Vancouver Island, where they have a lot of cougars. With the massive amount of large cat’s paws on this shawl, I found that very fitting. Furthermore, the frilly edge pattern sort of resembles foamy waters of a coastline. The name also makes me think of Victoria Falls, a pretty woman, victory, a rav friend mentioned victorian lace, and the shawl is even constructed like 3 V’s. The pattern is 4 pages long and the repeats are marked with colour, so you need to either print your copy in colour or mark the repeat on your paper copy with a highlighter or the like. Available in both Danish and English, make sure to download the correct file. Difficulty: Medium. The edge has pattern every row. Size after blocking: 22 inches (55 cm) deep, 55 inches (140 cm) wingspan. 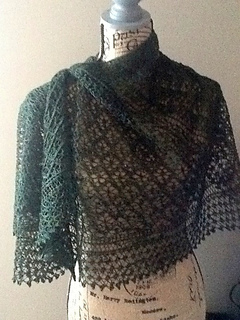 Gauge: You do not have to obtain a specific gauge to make this shawl, but shawl as shown has 2 repeats of chart A to 3 inches or 8 cm wide after blocking. 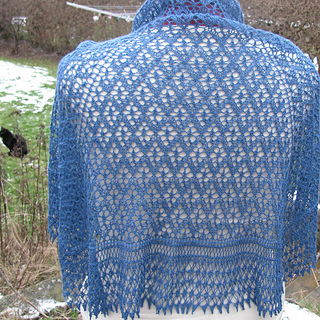 Construction: The shawl is worked from the neck and out. 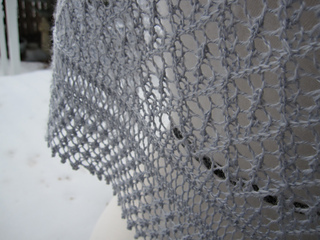 The edge is worked sideways and binds off the live shawl sts as you go, leaving only a few sts to bind off when you are done. Charts A and B are repeated three times every row.